I'm sitting here looking at today's beautiful BING page of Frankfurt's Christmas Market. I've thought about Christmas markets in the past, but the idea of crowds has detoured me. But, they combine three of my favorite things! Europe, Christmas and local markets! So, someday I think I really need to get to Europe for a market or two. So to get me daydreaming, what markets would people recommend? I'd want a more authentic, local experience in a town with other things to offer. Are there markets that are more sedate and less crowded? Does anyone have some experiences to share? Not that I wouldn't return, but I have been to some cities that are known for Christmas markets like Budapest and Vienna. 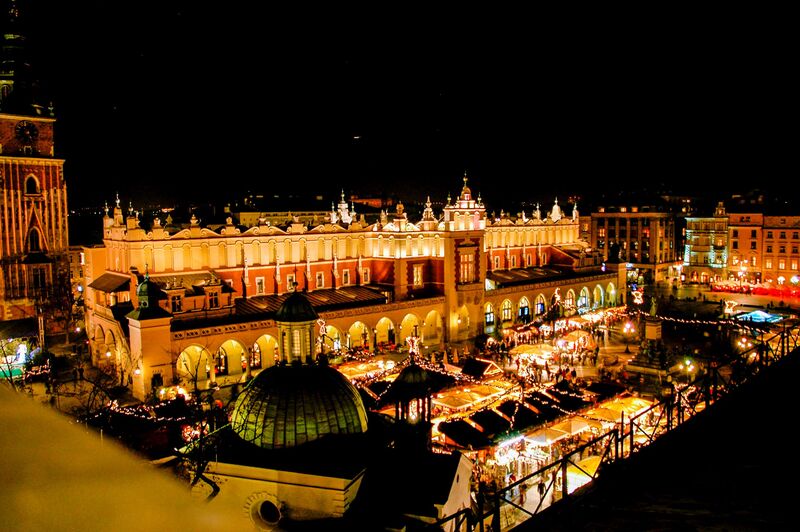 I wonder what Poland is like in December and if they have any great markets? I have been to Chicago's Market. It was fun, but on the small side and pretty crowded. I’ve been to Holiday Markets in DC and SF. They crowded at night and weekends. DC was small but found a knot hat and jewelry from small shops. Honestly, the best are probably the German and Czech markets. I have heard from friends who have been numerous times to Christmas markets that Vienna, Rothenburg, Colmar & Salzburg & Munich have fabulous authentic Christmas markets. The downside is they are crowded especially on weekends because I guess the locals go then. I'm going on the RS Munich Salzburg Vienna tour December 2019 specifically to experience the ambiance of the Christmas markets. A friend is in Europe right now for the Christmas markets and I think she might post a trip report when she returns. She's going to Stuttgart, Colmar, Paris & London. You might look for her report. Our experience is that all the markets are pretty crowded BUT that is what everyone wants especially those that are selling things. For us that is part of the experience -- at least in our opinion. Crowds add to the feeling of festivities. Strasbourg is the oldest dating to the 15th century. Very large spread over several sites. Rothenburg is much smaller and compact but the setting is terrific. Munich is huge and again over several sites. We enjoyed them all with Rothenburg our favorite because of location but Strasbourg was great because of the variety and special markets. But there are dozens of markets of various sizes. There is a sameness to all the markets. Too much sausage and glogg wine. I absolutely loved the little Christmas market spread throughout the Altstadt area of Ahrweiler in Bad Neuenahr-Ahrweiler, southwest of Bonn. I visited there last year and it one of most favourite ones. The little town has 6 towers around the walls and a great spirit. Good food IMHO for a market, including some regional items I'd never had elsewhere. 2 stations and parking under the market square. Oh and a Roman museum. I love Bad Wimpfen, north of Stuttgart and east of Frankfurt and west of Nuremberg. Love the hills and cobbles and old buildings and that nobody is there. This year it made Christmas Market number 1 in Time-Out so I guess a few will be there. I've never done the market there but I love the town. I like the markets in the smaller towns and there are a lot of really nice ones near Frankfurt. Many of them are just on one weekend though. Büdingen, (Imagine an original Rothenburg without the souvenir stores and a zillion touists) Idstein, Gelnhausen, Seligenstadt, Michelstadt, Limburg, Marburg, Frankfurt Höchst, and for 3 weekends, Bad Homburg and Ronneburg Castle near Gelnhausen. For large markets, Stuttgart wins hands down as it never feels crowded. The near by town of Esslingen wins for uniqueness. Even though it was snowing when I was in Munich, the market there seemed just ok, nothing special. Frankfurt at least has some cool areas and events like the Pealing of the Bells, brass bands playing on the gallery of the Alte Nikolai, the market in the City forest, or the Rosa Market. We even have 2 markets on roof tops this year. We stayed in Colmar for a week last year in early December. The town and the market were great, although we felt a tad claustrophobic with the crowds there. It was easy to day trip in the region, so we hit the Strasbourg Xmas Markets, Freiburg (Germany) and Basel Switzerland. Other smaller towns in the Alsace region had their own markets as well. Strasbourg was probably our favorite but we were very surprised with Basel’s Christmas Market and the town, overall. Almost got Xmas’d out with all the fa la la, but I have my Christmas Tree and Christmas Village set up in our Living Room again this year, so it didn’t permanently ruin me. In 2015 we did 16 different Christmas Markets, my dad and hubby were good sports about it. Some were big some were small. All had different things we enjoyed about them. Our favorites were Esslingen, Stuttgart, Michelstadt, Dinkelsbühl (It was quiet and small but super cozy), Nördlingen. We also attempted to do the Chocolate Festival in Tübingen. It was so crowded we didn't last long. BUt we went on the last day, which was a mistake. I am glad we did Nuremberg, and several in Munich. We were there during the week, so it wasn't as crazy. I really did not enjoy Rothenburg odT. Totally personal preference, but it was waaaay too touristy for me. I've been to several and loved them all. Here is link and lots of info and photos. My Christmas Markets trip was in early December, so maybe the crowds were a little less than later in the month. I was in southern Germany, Alsace and Salzburg. Markets only got started around lunchtime and many attract the local lunch crowd. There was plenty of time in the morning and early afternoon for sightseeing. The markets weren't very crowded until around 5-6 pm when the locals started congregating to eat and drink. Though in France, the markets seemed to start earlier and closed earlier too, and were more oriented to children. Every town had a huge central tree and a large nativity scene. Also many shops had beautiful decorations, especially in Alsace. I liked the Cologne (Koln) markets. There were 5 in total with a little train stopping at each of them; Cathedral, Old Town, Rhine river, Angels & reindeer. We started early in the day, they got crowed about 6 but midweek was good. I liked the Prague markets too, different than the Germany markets. It was very cold and snowy, not crowded. There was also at least 4 different markets there too. The vacation costs are worth the price of the trip, the Christkindlmarket in Chicago (Daley Plaza, Wrigley Field & Naperville) are expensive. Bring an empty suitcase! Great responses! Sounds like so much fun! We lived in Augsburg, Germany and always loved going to its Christmas Market. Unfortunately, not everyone in Europe now likes them. Someone on another thread commented that Budapest doesn't have the cheap manufactured stuff from China. Another great reason to love Budapest! Are markets in Germany "juried" so as to include just handmade/tradition items? We especially loved the Salzburg Market(s). While there were lots of people, it didn't feel crowded. The quality was generally very high and included lots of local handicrafts. We also enjoyed several of Vienna's markets. The day time is much less crowded there . Innsbruck had a very nice, but small market. We lucked up and were there on the opening day. We got to see the Krampen (I think that is the correct term). He is supposedly a devil(ish) character who will punish 'bad' children. Are any of the French and German Christmas markets in areas more likely to be less cold than others? I'm guessing that Colmar and Strasbourg are far enough north to be as cold as the German markets. Are Dresden and Nurnberg likely to be a little warmer since they are farther south? We went last year. Started in Paris day after Thanksgiving (2 nights). Then train to Strasbourg (wonderful markets) (2 nights I believe), Train into Germany and picked up rental car in Germany; drove to Rothenburg. One night in Rothenburg; drove to Nurnberg. 2-3 nights (can't remember) in Nurnberg--we were there for opening day of the Markets and also did a day trip where we took in the Christmas markets in Wurzburg and Dinkelsbuhl. Then Munich for 2 nights. Finished in Zurich. All had wonderful Christmas markets going, except Paris markets weren't going yet, but we love Paris (included a day trip to Chartes). Advice: the big markets like Strasbourg are great, but we really liked the smaller ones like Dinkelsbuhl and Wurzburg. Just got back from our first trip to Switzerland. Loved the markets in Montreux along Lake Geneva and in the Zurich HB train station. Zurich was really crowed on a Saturday night. We had been on the Sunday before late when we flew in and the crow was not so bad. Montreux was our favorite of the 2. We loved all the markets in the cities and villages we visited. These were Salzburg, Berchtesgaden, St. Wolfgang, St. Gilgen, Hallein, Rattenberg, Hall in Tirol, and Innsbruck. We also went to Sterzing and Brixen in Italy. Rattenberg on opening night is hands down the winner for us. Then Innsbruck at any time of the season. We went twice late November to early December. I hope the responses keep coming. Its a fun, informative thread. I don't get too concerned about weather, it's winter and Christmas after all. But this is coming from Minnesota where right now its 10F. I'm curious about you folks that are going to multiple markets in a day or on a trip. Are you making a lot of purchases? Or do the markets have a lot of displays and entertainment that make each unique? Do you wander and enjoy food and drink? All of the above? Don't get me wrong, it all sounds delightful. My husband has said that sometimes the churches just all blend together in his mind. Does this happen with the Christmas markets? Would people advise a trip with with a few markets and then see other tourist sights? Or as many markets as you can get to? How do you set your itineraries? Jim, I spent more than a week in January in Switzerland, but only a few hours in Montreaux at Chateau Chillon. Montreaux was prettier than I expected and I'd like to go back for my favorite places (Luzern and BO) but also to spend some time in Montreux and Lausanne. Most markets are pretty similar. It’s the setting and town or village that makes them different. Well sightsee a bit during the day and catch the markets rafter dark, which can be about 4pm. The lights just add the the festive atmosphere. We buy the. mugs the hot mulled wine and hot chocolate come in. A couple Euro per mug. Each market has its own u inquest design. Sometimes even the shape. We have a nice collection that we take out and use at this time of year. Good memories. Sure. Most of them are. Just avoid the big cities in Germany, which were mostly destroyed in WW2 anyway and aren't that romantique, and the places every American travel guide mentions, because they are overrun by tourists. Search for preserved small to medium sized towns with a Christmas market that runs for four weeks (because they have a successful concept) instead. And it's not true that all Christmas markets are the same. Of course they are all just markets that sell "stuff", but this stuff differs, and the traditions that surround these Christmas markets differ too. But you have to leave the American comfort zone Bavaria to experience different products and traditions. Poland is like in December and if they have any great markets? Neither Budapest nor Poland are known for Christmas markets. They are a tradition of the Germanic countries, and countries like the Czech Republic and Poland actually banned these markets for some time (after the Germans were expelled) because they were considered a German tradition. The local population also didn't miss them, and they arrived there just 20 years ago (sometimes again) mostly to promote tourism and trade. And if you are really adventurous and travel yb car: between Bavaria and Saxony, and deep in the mountains, is Lauscha, the place where the Christmas baubles were invented, which were made popular by Victoria and her husband Prince Albert, who was from this region. We're in Turin right now, and it has several small Christmas markets (I wasn't super impressed), plus last Sunday a huge event with thousands of people dressed as Santa (that was something to see!). Lots of regular "sights" in this city--museums and churches, etc. So it's not just Germany and Alsace (where we're headed next). That hot wine, though. I don't get it. It smells awful, and they serve it in styrofoam cups. No, please. I would say the most “local” Christmas markets we went to were Hall in Tirol and Berchtesgaden. Seemed like the early evening crowd were all the locals, after work. “Lower key”, meaning they didn’t feel at all put on for tourists. Allegedly the best Christmas Market is this: https://youtube.com/watch?v=GpLfv7nhdFQ . Actually there are many criteria like what you can buy there, price, atmosphere, beauty, how much fun you have there, etc. Considering beauty and atmosphere one of the best for me was Christmas Market in the Old Town Square in Prague. It was snowing and the towers of Tyn Cathedral were in the background. Almost fairy tale magic. And the best market by you tube? I agree, I was there. Very good for price, selection, fun. Actually there are not three markets but four there. This is great information - I decided just yesterday that my next trip to Europe will be in December to see some of the Christmas markets. I'm curious about you folks that are going to multiple markets in a day or on a trip. Are you making a lot of purchases? Or do the markets have a lot of displays and entertainment that make each unique? Do you wander and enjoy food and drink? All of the above? Don't get me wrong, it all sounds delightful. My husband has said that sometimes the churches just all blend together in his mind. Does this happen with the Christmas markets? I try to go to as many markets as possible, but for me it's kind of like an outdoor pub, I'm not going to be disappointed if they're all selling the same stuff. In fact we usually try not to buy "things" because that's more stuff to lug around and catch dust. We used to buy stuff for friends and family and ship them back to the US, but that got expensive and time-consuming. Now we go for the atmosphere and to enjoy food and drink, primarily. Markets definitely can blend together. This is why I recommend doing your research and trying to visit some that are very distinct. I'm personally biased towards the markets in Southwestern Germany, as there just seems to be a greater variety in a smaller area. For example, Stuttgart's got probably the best traditional city market in the country. Nearby is the genteel, Baroque Ludwigsburg market, and you can also visit the palace that inspires the market. In the other direction the medieval, un-bombed town of Esslingen has over 900 historic buildings mostly dating from 1200-1550, which is amazing year round, but very special with the middle-ages Christmas market. To the south, the old university town of Tubingen has a special, one-weekend only market dedicated to all things chocolate. Also only on weekends, the castle Hohenzollern has a market, and the medieval city of Bad Wimpfen on the Neckar River, and the beautiful UNSECO-recognized abbey at Maulbronn. Heading southwest, the Ravenna Gorge market in the Black Forest is hands down the most memorable market I've been to for the setting alone. But luckily you're near to the charming if rather typical market in Freiburg, or the market on a boat on Lake Constance in Konstanz. That's just like a fraction of of the markets down here. It's really hard to go wrong. Wow, if last minute tickets weren't so darn expensive, I'd jump on a plane right now! When do they generally start? I have four adult kids, and as close as we all are, they likely will come a day where no one makes it home for Thanksgiving. Are the markets going on then? or generally do not start until December? Avoiding the big cities in Germany is a terrible idea, Martin. The OP asked for more sedate and less crowded places mostly visited by locals. I am currently in Germany, I just spent 6 days in Berlin and now on a train down to Munich. I highly recommend doing the Alt Rixdorfer market in Berlin if you can. It was beautiful, they lit Kerosene street lamps and unlike some of the other market most of the attendees seemed to be locals. Here's a translated website about the market. Keep in mind it only occurs on the 2nd weekend of Advent each year. I'm not in a position to post any pictures yet, but I will when I can. Kraków has a really large and unique Christmas market, as it's held in Kraków's Market Square, which is the largest medieval town square in Europe. This Christmas market starts towards the end of November and lasts until December 26. There are many stalls selling traditional Polish foods and crafts, like my favorite Pączki (Polish donuts), Oscypek (smoked cheese from the Tatra mountains), and Bolesławiec pottery. 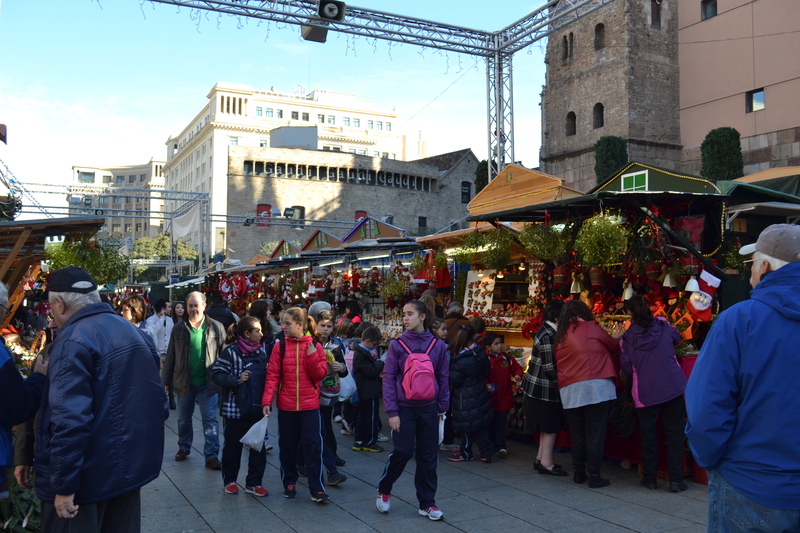 As well, in my hometown of Barcelona, we also have a tradition of Christmas markets that dates back to the 1700s. The oldest is called the Fira de Santa Llúcia, it's held from November 30 to December 23, and comprises of around 100 stands. The market is set up in front of the Cathedral of Barcelona, in the Gothic Quarter, so it also has a unique setting. Its biggest draws are its nativity scenes and the Tió de Nadal figures (which is a rather interesting Catalan tradition we have). Rome also has a pretty good Christmas market at Piazza Navona, among others. The Gothic cathedral is a great place for a Christmas market. If anyone is visiting that area around Christmas and after, they should check out the cloister of the cathedral. We were there at sunset and after. There were beautiful nativity scenes and duck and geese. There was a full moon so it was illuminated, too. Absolutely stunning memory. No, not good news at all. Heartfelt compassion to the people of Strasbourg and France, with hope that they find this vicious killer. The terrorist was killed by French police this afternoon. Neither Budapest nor Poland are known for Christmas markets. English is a tradition of the UK. But Americans do a pretty good job of it too. Budapest has very strong Germanic roots, but I doubt that has much to do with the great markets. Just got back from a business trip to Aachen. Enjoyed the Christmas market there immensely. Tried to get to Frankfurt's before I flew out but just didn't have the time. Wandering around the Aachen Cathedral with thousands of Germans, mostly drunk, and all of them just having a blast was definitely a highlight of the trip. I could have sworn that I was the only American there. Note: bring cash. Definitely going to plan a Christmas Market tour in the next few years. Not to be missed. In Aachen you most likely were. I've only been to Aachen twice, the first time in 1973, the second time 25 years later, both times in the summer. Opening dates vary from town to town. Even open days of the week in smaller places. For instance, Innsbruck, Salzburg and Hall in Tirol usually start mid November. Some end 12/24. Some stay open until 1/6 or so. The Travel with Rick Steves podcast (#548) covers German Christmas markets this week, the first 13 minutes. It isn't available yet on this website, but you can find it on podcast distribution websites. Steves' opinion: "These Christmas markets are essentially all the same. If you've seen one, you've seen one." They don't get old for me at all. I go to at least 6-8 Christmas markets each year and try and visit at least one new one. They all feel different to me. The settings, the local groups raising funds by selling home made cakes, knitted caps, waffles, etc. In Büdingen, the Moravians selling those pretty stars and lots of hand made wooden objects is a highlight for me and I always end up getting something small. If you go to markets that also have an indoor setting you get the real artisans and craftspeople selling their wares. Gorgeous, creative stuff. Seligenstadt has one of these as I believe Regensburg in the Thurn & Taxis. Esslingen with their large medieval market or the one held in Ronneburg Castle are both very unique. My suggestion though is to move away from the usual markets that get suggested by everyone like Nuremberg, Munich, or Rothenburg because there are much better ones than those 3. Move north, east, west, central, find the little ones only held on one weekend, go to the medieval ones, find some that are held in and around old castles. Make sure they are in towns that have other things to see and do in case the weather becomes dreadful. See if there are other events happening along with the market that might make it even more memorable, like a special concert in a magnificent church, everyone singing in a plaza, brass bands playing or something like the Pealing of the Bells in Frankfurt. Those will all set your experience apart and make each market special for you. The BING page has another home page of a Christmas market. It's in Germany's Black Forest at Ravennaschlucht Christmas market. I went to lovely Copenhagen last December, and was really looking forward to the Christmas Markets. I was very disappointed, as there were multiple stalls that looked identical, a lot selling stuff made in China, and just not very appealing at all. The lights and cold weather and trees were lovely, but I wouldn't rush back just for the markets. I think the Slavic countries may still have good ones with handmade goods, maybe? Loved Copenhagen in winter, though!! In Budapest everything that is sold must be locally made and must be approved in advance by a committee. As a result the products are really pretty special. You would have to travel all over the country visiting artisans to begin to equal it: so it is a rare opportunity. This is just one, I am sure there are others that do the same. I just cant imagine the markets in Germany, the birth place of Christmas markets, doing any less. Interesting observations. With out taking a side on the issue, if such things do concern you, and you have that right irregardless of reason or cause, then you might want to focus your travels to those few remaining countries that still maintain relatively hard borders. Personally I'm not so scared by it, yet, to let it limit my travel, but I am sympathetic to those that are. And remember the terrorist get the headlines while some countries have other equally leathal things going on. So you need to do your research. Last year I went to markets in Munich, Nuremberg, Salzburg, and Vienna. The latter three were all great, but Munich was on a Saturday and it was insanely crowded. Next year I'm going to Nuremberg and Vienna again, plus Rothenburg, Dresden, and Prague. I've yet to to find a Christmas Market that I don't love, and I expect that unless you're dead inside, everyone else will feel the same. Bottom line, if you think you'll love it, and it's a dream of yours, you will definitely love it, and you should do whatever you can to go. And, once you're done with these, why not head out someplace where the markets and lights will last well into the new year - like Moscow or Kiev? I've been in both Moscow and Kyiv after the first of the year and things wound down quickly by the 7th. And both were very junky compared to a good market like Budapest (which is open till New Year by the way). Otherwise Kyiv and Lviv are great places to be for Christmas. If you do it right you can have a Christmas that lasts for weeks. Start off in Germany, then on to Budapest on the 22nd to get the best of their market, then on to Kyiv or Lviv as their Christmas isnt until the 7th, but as I noted the markets wind down a bit after the Gregorian New Year. Lviv in particular has some wonderful things going on leading up to the 7th.